Antique original Jewelry box, 18th century, "Bottega Milanese dei Valentini" attributed, restored and polished to wax. Jewelry box veneered rooted elm, elm burl frames worked crosswise, veneered cover with burl maple boxed thread bois de rose, central inlaid with various precious woods. Interior lined with white satin damask. Key closing. Finish shellac applied to the wick. We have only nurtured with wax and polished cloth and redid the interior lining with a similar vintage fabric. Measures cm: H 10, W 29, D 19. History, curiosity and provenance of this Jewelry box : Belonging to the last heir of ancient noble family “Della Torre di Rezzonico”. This branch of the family is originally from the village of Rezzonico on Como Lake. Andrea Erecco Della Torre would be the ancestor that gave origin to the Della Torre Rezzonico family. In 1640 Aurelio Della Torre moved to Venice in order to pursue the trade. Amassed immense fortunes which he bequeathed to his nephews Giovanni Battista and Quintigliano who obtained the Venetian nobility. Giovanni Battista married a lady of Venice and from marriage was born on March 7, 1693 Carlo Rezzonico, who in 1753 became Pope (Clemente XIII). Registered in the Court of Arms of Government Lombardo on November 20, 1769. Elegant walnut flap. It has a rough front with three drawers and a calatoia door. Restored and polished to wax. Excellent conditions. Measures cm: H 105, W 106, D 55. Louis XV 1940s little side cabinet or nightstand blond walnut and walnut inlay maple, restored and polished to wax Measure cm: H 60 x W 40 x D 26. Game box in burl of the 20th century with chips and assorted games. Italy, 1950s. Paleolithic hunting scene on wooden segmented jewelry/cigarette box. Fully functional, hinges work smoothly. 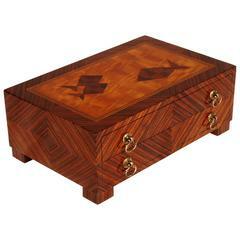 Jeweler box in marquetry of different woods and applications. Artdeco period. circa 1930.